In agriculture and plant breeding the most important genotype × environment interaction pattern is crossover genotype × environment interaction. Procedures using linearbilinear models are used to find disjoint subsets of sites or genotypes with negligible crossover genotype × environment interaction. In terms of correlations, these subsets of sites or genotypes should be such that pairs of sites have nearly perfect positive genetic correlations. Perfect positive genetic correlation between sites is a sufficient, but not a necessary, condition for a non-COI pattern. The main objective of this study was to use the mixed model theory to confirm that the subsets of sites and genotypes formed by using the linear-bilinear models have negligible crossover genotype × environment interaction. If there is no significant crossover interaction in a subset of sites or genotypes, then the mixed model should be able to confirm this by nonrejection of the hypothesis that the covariance structure has perfect genetic correlation. 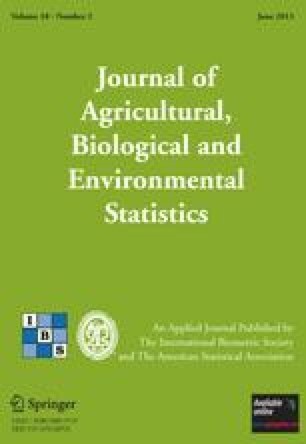 Mixed model analysis of results from two multisite cultivar trials confirmed the validity of the procedures using linear-bilinear model methods for clustering sites and genotypes into noncrossover genotype × environment interaction subsets.